Watched a little coverage of this and had to turn it off. Heartbreaking to lose so much priceless and irreplaceable art and history. Art and history indeed. Tragic. Paris is packed with world class destinations but ND is my very favorite place to visit in all of France and among my favorite places on the planet. I can't imagine how a construction accident could result in this degree of obliteration; the loss is incalculable. So many questions and I'm sure there will be a major investigation. Can only hope it will bring changes in how seminal cultural icons are monitored and protected, but the apparent devastation is beyond belief and a tragically high price to pay. Meanwhile, checking local news I catch a segue from this to Tiger Woods. Just find quotes from Dolt 45 on this subject and try...TRY...not to laugh/cry. The two towers and the structure as a whole are now saved. But the fight against the fire will probably last all night. So far only one fire fighter was gravely hurt. One too much, but more could have been. The framework of the roof, that was from the XIIIe century is lost. Those flying buttress' are iconic. damages, but they are obviously going to be huge ! By the way thanks to President Trump for his silly tweets. I had a laugh. How odd of God that he didn't prevent this altogether. I suppose this will in some way make the people of Paris "stronger". Imagine if we humans put even a fraction of the effort we've placed into creating a complicated, illogical pleasant fiction for ourselves into something that was actually productive. What if Notre Dame was a hospital and a centre for studying exotic diseases, rather than a monument to a being that either willingly destroys, or doesn't care enough/is unable to prevent being trashed in a matter of hours. Notre-Dame is a masterpiece built during Middle Age. Parts of the frame were the same since the 13th century. It's one of the most beautiful spot to see in Paris. It's medieval art in its highest form. And yes art in Middle Age was religious. And no there was no centre for studying exotic disease in Middle Age. I don't believe in God but I'm sad. Religion has nothing to do with this. Koroush I'm afraid you'll never enjoy visiting Roma. From what I understand there has already been a pledge of $300+ million dollars (francs?) from two French billionaires for the inevitable reconstruction. Let's take the prayer logic even further and determine if Dog's will partially destroyed the church then why rebuild it? Isn't the act of rebuilding going directly against the master's plan? It would be a miracle if ONLY the glass remained, floating in place, without all of the other portions of the church that survived, right? 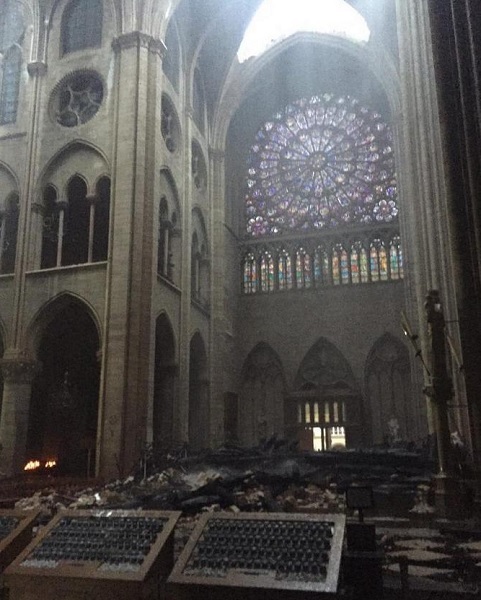 Perhaps the miracle is that there is very little flammable material around the Rose Window? I have always viewed grand churches with equal parts of wonder and disdain. Wonder for the artistic and architectural expression of man, but disdain because such artistry is constructed in the name of blind faith. We use euros now Eric, not francs ( and that for almost 20 years, where have you been ?) and yes these two millionnaires have already offered 300M euros, that's slightly above $300M. A commentator said money won't be a problem to restore the cathedral as people all over the world will donate and have in fact already started...Some lesser known historical buildings are more endangered and in need of restoration funds...but hey that's Notre Dame ! Philippe, the radio report I heard said "dollars", but I knew that couldn't be right. I do think Notre Dame should be restored along with many people all over the world, but my reasons for why it should be restored are most likely in the minority. Guys, you should not see this as something in relation with faith. It's french historical heritage. I think it's in fact humankind heritage. And I guess it's the reason why there's a lot of emotional response to this. Given the dark history of the Catholic Church, I am not sure this can be viewed entirely without religious overtones. It's like trying to divorce Confederate monuments from slavery. Of course! It remains a cathedral. And it was still used until the fire (I believe there was a mass). But don't forget that during five centuries - until the French Revolution - the king was supposed to be chosen by God. Catholic religion and political power in France were very close and at the same time were caught in a struggle. During the Revolution, clubs (the ancestors of our political parties) used closed monasteries and convents as headquarters. All of our old architecture, the way our cities are built is influenced by Catholic Church. But at the same time, since 1905 Church and State are stricly separated. I understand restoring the Notre Dame is important, but... 600 million euros seems a lot. Are there better things to do with that money? The art that wasn't evacuated can't be replaced. And I cannot see this divorced from religion. This is a cathedral, after all - as well as a repository of priceless treasures. "One of the city’s five senior vicars, Philippe Marsset, told AP: “If God intervened (in the blaze) it was in the courage of the firefighters.”"
Now that's one I can get behind. Sure, cuz those brave men and women couldn’t have been brave on their own.